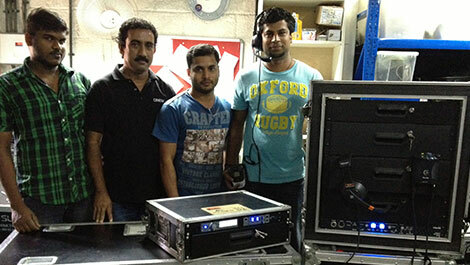 Nicolas Kyvernitis Electronics Enterprises, distributors of ClearCom in the United Arab Emirates for the Live Sound market segment have recently supplied the Tempest wireless intercom system to Dubai based, SLS Productions. The company now complements their existing two-wire systems from the Encore range of ClearCom to provide a flexible and sophisticated communication solution for their various high profile events. Operating in the 2.4GHz band, the Tempest2400 is available in a robust 2 or 4 channel system for indoor, outdoors and touring applications. The system is also capable of operating in multiple modes, with each mode providing varying level of communication flexibility and user capacity. Unlimited number of users is possible in Split and Shared Modes. In Normal Mode, up to 10 BaseStations and 5 full-duplex wireless BeltStations can operate on one system with no frequency coordination required. In addition, once registered to a base station, a beltpack needs no further configuration and roams freely within a single zone area, making it perfect for live sports, breaking news, and high-coordination productions such as awards shows. “ClearCom’s Tempest system is the most sought after wireless intercom solution for high profile concerts, events and production applications where remote monitoring and control as well as clear two way communication is necessary,” commented Chicco Hiranandani, Business Development Manager at NMK.